Sitting at the intersection where Grodzka Street meets the Main Market Square, Krakow’s oldest and most enchanting church, St. Adalbert’s (Polish: Kościół św. Wojciecha) overlooks one of the busiest pedestrian avenues in Europe. Built in the 11th century, the pale walls and oxidized bronze dome of St. Adalbert’s have witnessed nearly 1,000 years of the city’s history. 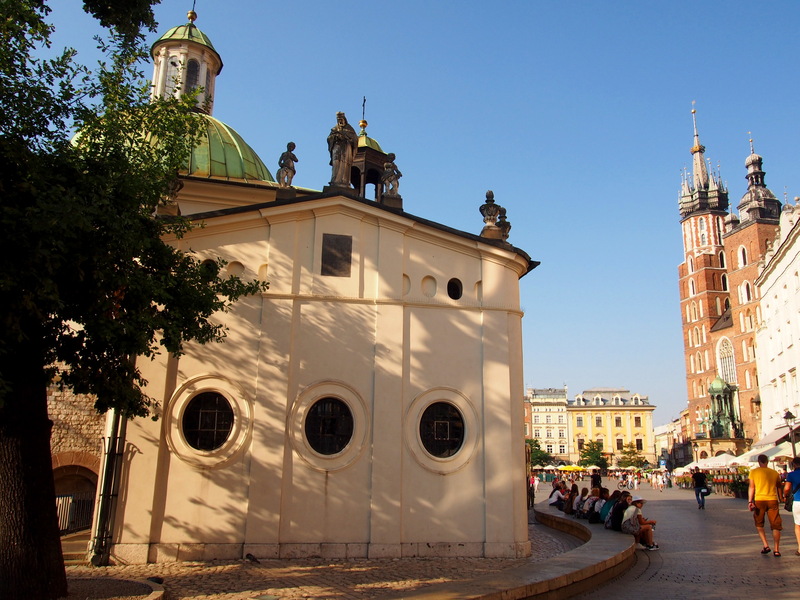 It remains a living church where Krakow’s faithful go to pray, and is one of the best places to listen to live classical music in Krakow. Its well-lit, cobble-stoned external promenade is one of the best meeting points in the old city, and is surrounded by rows of benches where locals and tourists alike can stop to eat a snack, take a picture, or sit and enjoy the shade. The site of St. Adalbert’s was originally home to a smaller, more modest wooden church built in the 10th century. The stone church that stands today was built a hundred years later, and finally remodeled with the present Baroque style in the years of 1611 to 1618. 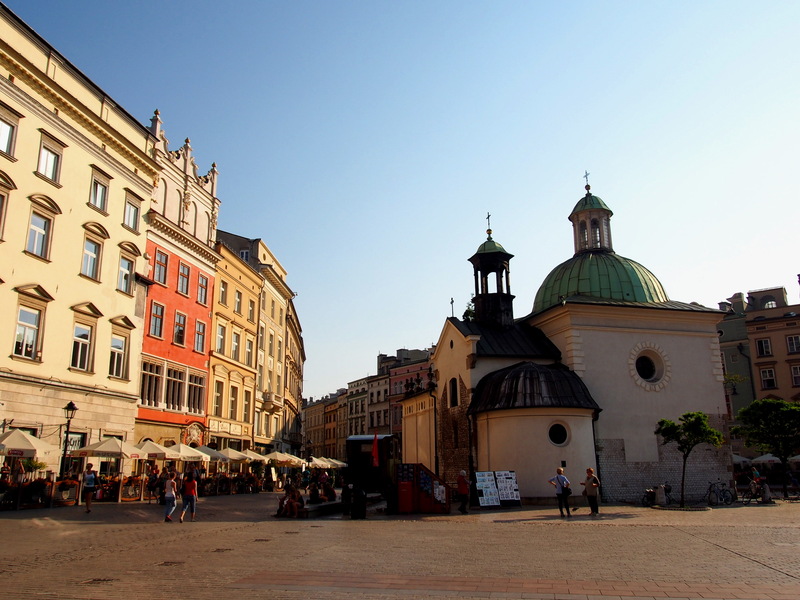 Named for the Czech saint who was martyred for bringing Christianity to Prussia, According to legend, he once visited Krakow and consecrated the very ground this church was built on, St. Adalbert’s predates both the Market Square (officially demarcated in 1257) and St. Mary’s Basilica (built in 1347). The interior of St. Adalbert’s, while far smaller and less opulent than many of Krakow’s other churches, is just as awe-inspiring, telling of a simpler, humbler time, before human faith required such grand architectural statements. 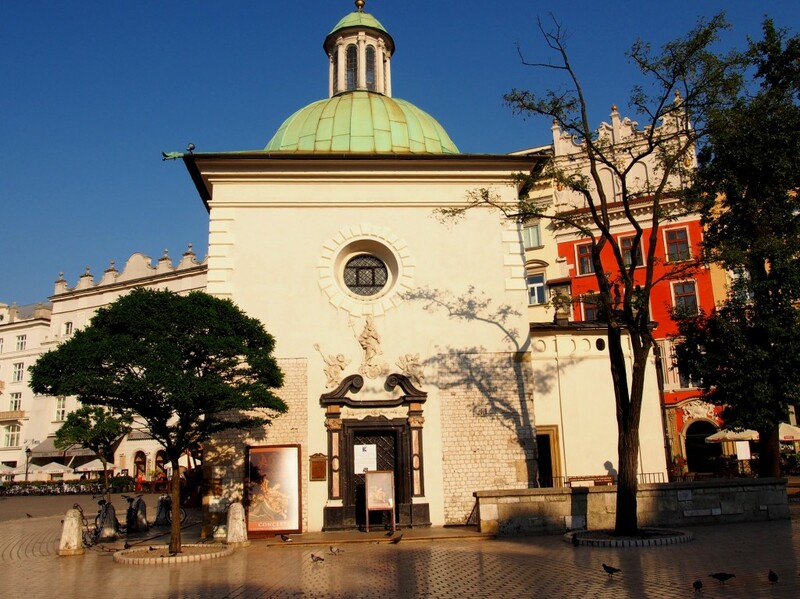 The church is home to regular live classical music concerts performed by the Royal Chamber Orchestra, an ensemble consisting of recent graduates from Krakow’s prestigious Academy of Music. Concerts are every odd day of the month at six P.M., and feature pieces by such composers as Bach, Mozart, Vivaldi, and Horner. Costs: Concert tickets are 65 PLN with discounts for groups of over four people. Entry is free for worshippers. Best time to see it: In the evening.